Thursday February 23 1911 I was down at the house where Mr. [Denny?] was papering. I helped him make [illegible] in the morning. I went to town at 3.15 did some errands and went to The Newton lecture. I [illegible] [at?] 5.30 so did not get home till late did evening work. Friday February 24 1911 Doing the work and down where they were papering. Will helped all the time I went down home at 1.15 The girls both wanted to go away. Rueben Home and brother called. I came home at 5.30. Did evening work and read some. 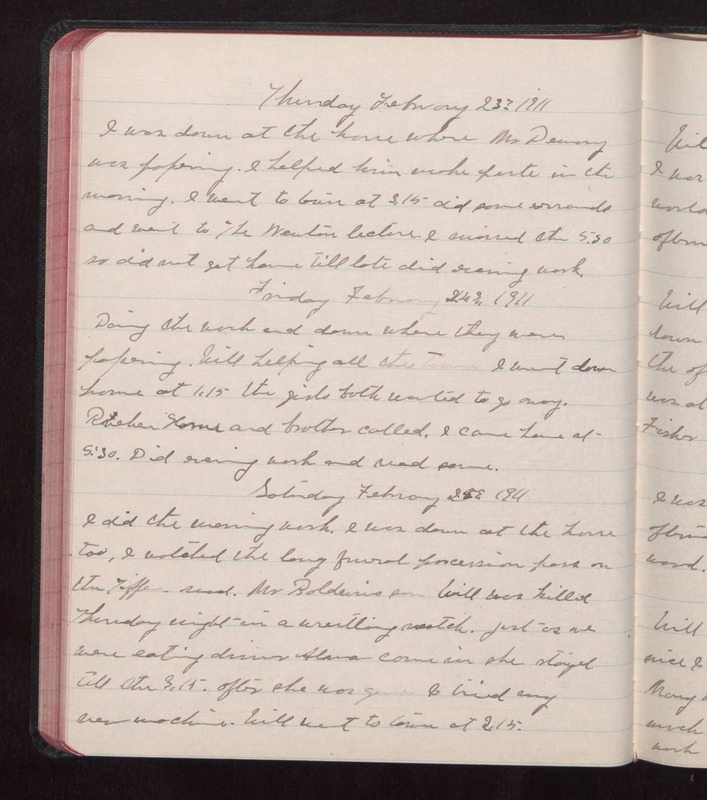 Saturday February 25 1911 I did the morning work. I was down at the home too, I watched the long funeral procession pass on the [Tiffen?] road. Mr. [Boldeiris?] son Will was killed Thursday night in a wrestling match. Just as we were eating dinner [Alma?] came in she stayed till the 3.15. After she was gone I tried my new machine. Will went to town at 2.15.